Football is a beautiful game. The NFL knows this. But how is the sport marketed? Mostly with quarterbacks. Maybe some receivers and a running back or two. But if fans watch the game to see men performing almost superhuman tasks, stuff that is like what most people can do but is more kinetically gorgeous than anything we see in daily life, then I don’t want to watch quarterbacks. Instead, I want to watch a 300-pound man do things that no one should be able to do, typically to some other colossus who stands in his path; in short, I want to watch the New England Patriots’ Vince Wilfork pulverize some other enormous human. Here’s an example. Late in the AFC championship game, the Baltimore Ravens trailed the New England Patriots 23-20, with the ball on the 33-yard line and less than three minutes to play. It was fourth and 6. Baltimore shifted into a four wide receiver set and the Patriots made a late adjustment to confuse the Ravens. After New England shifted its front, Baltimore’s pro bowl center, Matt Birk, was left one-on-one with Wilfork. Birk is 6-foot-4′ and 310 pounds, and he had no chance. As soon as the ball was snapped, Wilfork had beaten Birk. He got underneath Birk — Wilfork’s arms were firmly planted on Birk’s chest, while Birk flailed his arms to try to regain some semblance of leverage. With his back flat and leaning forward, Wilfork drove Birk backward; in coach-patois, he put Birk on “roller skates” and slid him directly into Ravens quarterback Joe Flacco. Wilfork eventually grabbed Flacco’s jersey, forcing a desperate heave out of bounds, but as much as anyone else it was Birk, driven backward by Wilfork, who disrupted the play and sent the Baltimore offense off the field. Wilfork, through force, speed, and technique, had turned Birk into another New England defender. Such performances are beauty and truth, all in one 325-pound package. Despite these moments of mastery, the Patriots defense has not been very good this season. The statistics are ugly and the defenders themselves are a motley group of undrafted rookies, castaways, and converted wide receivers. But no team wins a Super Bowl in today’s salary cap-limited NFL by assembling a perfect roster. What New England coach Bill Belichick has is a jumble of defenders with varying skill sets who are all anchored by one immovable object: Wilfork. And good coaching is about making the most of what you have. Aside from discussions of its general mediocrity (or worse), the hottest topic about the Patriots’ defense has been how hard it is to define. Is it a 3-4 defense (the three-defensive linemen, four-linebacker defense that Belichick has run for two decades)? Or is it a “4-3” (the four-defensive linemen, three-linebacker set that New England has favored this year)? The truth is that they play a bit of both. Then again, simple labels like 4-3 and 3-4 don’t tell the full story. These 4-3 and 3-4 teams typically differ in a key respect: which “technique” their defensive linemen use. Usually, teams must commit to one technique or the other, as each choice has all sorts of other implications for the defense. It’s truly a philosophical choice. Yet Belichick and his vagabond defenders have found a way to get the best of both worlds (relatively speaking) to best fit the Patriots’ strengths. To understand Belichick’s strategy, we have to understand how these techniques have evolved over time. Playing defensive line is all about technique (although it doesn’t hurt to be enormous and incredibly athletic). But it’s about more than just large men pushing each other around. A defensive lineman must always be in the right position. Big running plays don’t happen simply because one team wanted it more or because they knocked the other guy off the ball. It’s all about angles and leverage, along with the technical savvy that makes the difference between a stuffed run and a 50-yard touchdown. And the first question for a defensive lineman is always, Am I playing a 2-gap technique or a 1-gap technique? “Gap” refers to the area between offensive linemen. A 1-gap technique is just what it sounds like: The defensive lineman lines up in front of the gap he is responsible for and his job is to attack and control it. If nothing else, a defender must not allow a runner to go through his gap. While defensive linemen attack their gaps, the linebackers behind them are responsible for their own gaps. 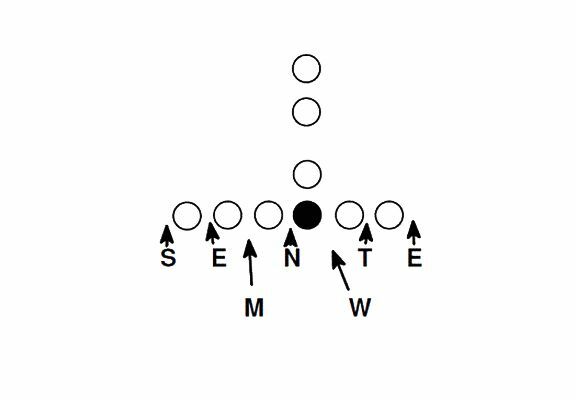 These are the defense’s “run fits,” meaning how they fit into an offense’s blocking scheme to take away running space. The 2-gap technique, by contrast, sounds physically impossible. How can one player occupy two separate gaps? He does it by controlling the blocker. At the snap of the football, a two-gapping defensive lineman does what Wilfork did to Birk. He leads with his hands, gets leverage on the offensive lineman, and takes control of the blocker. From there, the advanced techniques kick in. On run plays, the defender reacts to where the blocker tries to take him. If he is double-teamed, he’ll try to split the blockers and either shoot into the backfield or occupy the blockers, thus freeing up his teammates to make tackles. In short, while a 1-gap player attacks gaps, a 2-gap player attacks people. Football’s conventional wisdom states that an effective 2-gap lineman, particularly one who lines up in the middle of the defense like Wilfork does, must be enormous. Coaches refer to them as “war daddies.” But size is actually less important than athleticism and smarts. The line between touchdowns and stops in the NFL is exceedingly thin, and it’s footwork and feel that are the difference. It is the most violent, most complicated, and most beautiful ballet I can think of. So how did these techniques develop and evolve? In the early days of football, essentially everyone used a 2-gap approach. It was all about beating blockers. 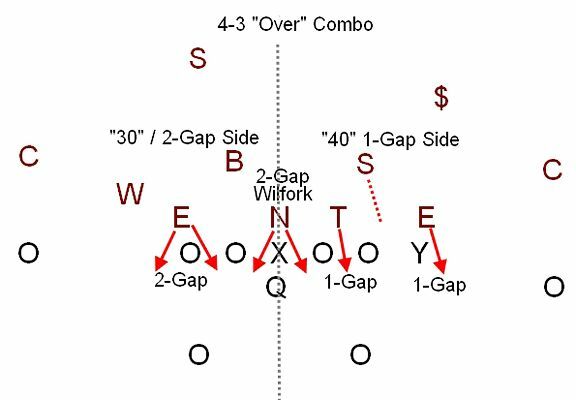 One-gap techniques existed in blitz schemes where defenders were sent to specific spots, but as a general matter almost all defensive fronts for the pre-modern era of football relied on some kind of 2-gap concept. The T formation put the quarterback under center while others in the backfield ran in all directions. It was misdirection and confusion for the defense. And its most famous game was the 1940 NFL Championship, when Bears coach George Halas unveiled it against the Redskins, who had defeated them just a few weeks earlier. The result was different this time, as the Bears nuked the ‘Skins 73-0 and Washington had no answers for Halas’ new attack. In the NFL, defenses varied more owing to the need to stop passing teams, but even those variations typically relied on Monster-based principles. But eventually, this approach was forced out by the wishbone, triple-option offense. The wishbone never took hold in the NFL, but that doesn’t mean its effects weren’t felt there, albeit indirectly. The 5-2 Monster and its related defenses couldn’t handle the wishbone. Great wishbone teams, beginning with coach Emory Bellard’s University of Texas squads, began decimating defenses. In 1971, Oklahoma averaged over 470 yards rushing per game with the wishbone, a record that stands to this day. By not blocking some of the Monster’s 2-gap defenders to instead “option” off them, wishbone teams could trick the defense every time. A 2-gap lineman can’t “control the blocker” if the blocker doesn’t engage with him at all. And because the offense chose not to block certain people, it had a numbers advantage against the rest of the defense. The 5-2 was out-leveraged and outnumbered against the triple option. But the story of football schemes is always one of punch-counterpunch, and the wishbone helped usher in the modern NFL defense. In 1979, Oklahoma State, a team whose schedule was perennially loaded with great wishbone teams, hired a defensive-minded coach named Jimmy Johnson. In addition to his NFL experience with the Pittsburgh Steelers, Johnson had also served as defensive line coach at Oklahoma. He was even there during 1971, where he faced that record-setting rush attack in practice. Johnson saw every day how much trouble his defenders had with the triple option, given the Monster concepts he’d been teaching them. In Johnson’s Miami 4-3, aggressiveness, playing your assignment, and, above all else, speed, ruled. He famously made linebackers out of safety recruits and defensive ends out of linebacker recruits. His 1-gap scheme allowed him to use smaller, faster, more athletic players. Johnson also lined his cornerbacks up near the line of scrimmage so they would be available to stop outside runs, while the safeties aligned deep. All together, Johnson’s defense was sound against the wishbone. The middle linebacker covered the infamous fullback dive up the middle, while the other defenders — the defensive end, outside linebacker, safety, and cornerback — could account for the quarterback and pitch running back. Nowadays, whenever you see a defense smother a poorly run speed option on the sideline, you’re seeing Johnson’s principles at work. But then a funny thing happened. It turned out that Johnson’s 4-3 defense, designed to stop the wishbone (a so-called “college offense”), was extremely effective against almost everything, including NFL offenses. Johnson proved this by winning a couple of Super Bowls as head coach of the Dallas Cowboys using the same Miami 4-3. Johnson’s 1-gap approach was so effective it almost completely took over the NFL within just a few years. In fact, all of the “Tampa Two” defenses that later became popular were directly derived from the Miami 4-3. Such trends are always easier to see in the past. Here in the present, amid various strategic schemes and approaches — 3-4, 4-3, 1-gap, 2-gap, spread offense, pro-style, and so on — the trends swirl about and collide without any discernable pattern. In recent years, defenses have undergone radical changes and even have come back to the 2-gap (and even 1-gap) 3-4 schemes. Meanwhile, offenses have gotten more varied and spread than ever. Right now, there is no clear-cut favorite between 2-gap and 1-gap approaches. 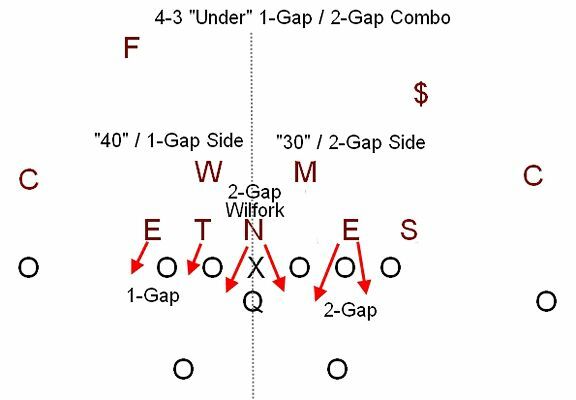 1-gap defenses keep schemes simple, but in a world of wide-open offenses, the 2-gap approach allows defenses to keep extra players in coverage and to blitz from unexpected spots. We see lots of different defensive systems in the NFL right now because schemes in general are in flux. This is precisely the atmosphere in which Bill Belichick thrives; he’s comfortable amid shifting ideological currents. In addition to being a veteran defensive coach, Belichick is known as something of a football historian. His father coached for a very long time, including roughly four decades at the Naval Academy. Belichick grew up around football coaches, and he has witnessed this strategic evolution. So what has Belichick done with his oddball assortment of defenders, anchored by Vince Wilfork? Did he choose 3-4 or 4-3? One-gap or 2-gap? Traditionally a 3-4 coach, Belichick ran this system even when almost every other NFL team was mimicking the 4-3 defenses popular in Dallas and Tampa. But Belichick now finds himself in a time when, by desire and necessity, he has largely moved to a four-man line approach. And yet, in typical Belichick fashion, he has chosen not to rely solely on the 4-3 or 3-4 or a 1-gap or 2-gap approach. Nor does he just alternate between 3-4 and 4-3 looks from play to play. Instead, Belichick has essentially combined both approaches in the same play. How? The Patriots run a 3-4 to one side of the field and a 4-3 to the other, all on the same play. The key to all this is Wilfork. He lines up over the center and assumes his traditional spot of run-stuffing, blocker consuming, two-gapping war daddy. Belichick fills out the rest of the pieces based on the strengths and weaknesses of his other defenders. In the traditional 4-3, there are two basic fronts: over and under. In Belichick’s hybrid 4-3 “over,” Wilfork is responsible for controlling (that is, destroying) the center and thus the gaps to either side of him. To Wilfork’s left, the defense functions just like a regular 1-gap 4-3 scheme, with the other defensive tackle attacking the gap between guard and tackle and the defensive end covering the tight end. The strong-side linebacker aligns to this side, and there will often be further run support, either from a safety or a cornerback. To the other side, however, it’s all 3-4. The defensive end to Wilfork’s right is a 2-gap player, and there are two linebackers to that side as well, lined up as they would be in a traditional 3-4. The traditional 4-3 “under,” which Monte Kiffin made famous with the Tampa Bay Buccaneers, has the defensive line slide away from the tight end while the strong-side linebacker lines up facing the tight end on the line of scrimmage. This gives them something of a five-man front, in a nod to the old 5-2 Monster. Belichick’s version is no different, except he again uses Wilfork to anchor the defense as a true 2-gap player in the middle. This time, the 3-4 side is to Wilfork’s left, toward the tight end, and the 4-3, one-gap side is to Wilfork’s right. By combining these techniques into one defense, Belichick achieves what seems most important to him these days — versatility. He’s able to plug different guys into different spots while knowing he has Wilfork anchoring the middle. As NFL offenses have become more and more spread, Belichick’s defenses have become more versatile. With one or two players 2-gapping on a given play, the outside linebackers in particular are free to blitz, drop into coverage, and attack running backs all over the field. Belichick rarely lets his scheme turn into a true 4-3; more often, he’ll use the same assignments for each defender but use 3-4 personnel. The variations are endless. And it all works because Wilfork is in the middle, dominating his gaps and putting his blocker on skates. Of course, nothing Belichick does will transform the Patriots’ defense into a great one; they don’t have the talent. But coaching is about more than talent. It’s about taking the talent that’s available and giving it the best possible chance to succeed. And that’s something Belichick does incredibly well. So while this New England team may never be known as a great, or even good, defense, they’re hoping to be remembered as something much better: a Super Bowl-winning defense. To read the rest of Grantland’s Super Bowl coverage, click here. Even more extremely, the center could snap the ball to any one of the people in the backfield, rather than solely to the quarterback as is the norm today. This was the case with the famous “Notre Dame Box” offense, which gave rise to the most famous piece by this site’s namesake, Grantland Rice, about Notre Dame’s “Four Horsemen of the Apocalypse,” who composed the four corners of the “box” formation. Chris B. Brown is a contributing writer for Grantland and the editor of the website Smart Football. His latest book is The Art of Smart Football.